Since I can't really run right now (curse you IT band), I've been reading running books instead. 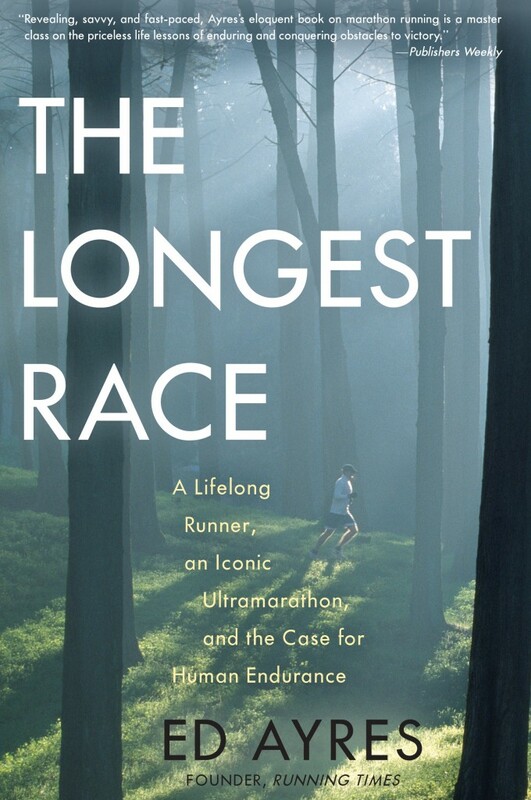 I just finished The Longest Race: A Lifelong Runner, an Iconic Ultramarathon, and the Case for Human Endurance by Ed Ayres (a distance runner with a half-century running career) and definitely recommend it. As a running addict myself, I've written and read my share of race reports (many on this site, obviously) and, when you break it down, Ayres' book is essentially a 200-page race report. The race in question is the 2001 JFK 50 Mile, a trail race that starts in Boonsboro, Maryland and covers sections of the Appalachian Trail. It's been going on since 1963 in response to JFK urging Americans to get in better shape in an article in Sports Illustrated called "The Soft American" and his challenge to the military to walk 50 miles in 20 hours. In this particular race Ayres is attempting to break the course record for the men's 60-69 age group (and to break 8 hours). A little back story: he won the race in 1977. Throughout the course of the book Ayres describes the race, the trail, the other runners and, most importantly for any race report, his experiences along the way. What makes this more than just a race report (and it better be more than that since it's 200 pages long) is his reflections on his lengthy running career, his work with the Worldwatch Institute and his work for Running Times (he was founding editor and publisher of the magazine). Ayres is a dynamic writer and his descriptions of the course, his competitors, the spectators and the history of the race make for captivating reading, particularly for those who are already into running (and who's reading this book that's not?). But he takes this book a step further and attempts to make analogies between endurance running and society, making the case that society should function like an endurance runner instead of like a sprint runner. In short, we should be more ecological and economical with our resources. It's a pretty good metaphor, and I'm certainly on board with him (both in running and in societal practices), but this metaphor sometimes feels a little forced and slows the momentum of the book a bit. In the midst of describing a turn on the trail he'll start talking about nuclear development, which can be a bit difficult to follow. Similarly, when he gives the history of running as it relates to human evolution, which he frequently does, it feels a little too speculative for my tastes. There are other books on this topic that are much more in-depth and offer real data to back up the claims of persistence hunting and the evolution of our species. Personally I like this article from Outside magazine, which was actually the first I had heard of this persistence running for hunting concept. I do like that Ayres worked some of this information into his book but it also feels a little beside the point for this particular race report. Still, "The Longest Race" is a fun read, particularly in his descriptions of the course and his thought-process as he's attempting to maintain his energy and speed throughout the race. Ayres comes off as an interesting and intelligent guy - someone I would definitely love to chat with on a long run... if I could keep up with him. The last 20 pages or so of the book are an appendix titled "Notes for an Aspiring Ultrarunner" and give a series of tips for anyone who hasn't yet tackled an ultra but is thinking about it. This section is extremely helpful advice and written in an informal style that makes it easy to take in. If I were planning to train for an ultra, I would look to Ayres for guidance.